You are here: Home | News | Environmental Projection - What is It? Environmental Projection - What is It? 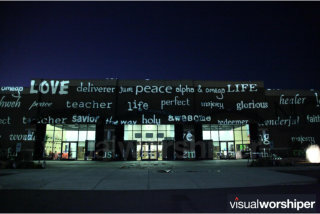 is a term that describes the art of visually transforming your surroundings from a blank palette into a digital canvas through the use of projection technology. Enhance your audience’s visual experience by creating an atmosphere which is condusive to learning. Teachers, use your classroom to paint a subtle but powerful canvas where your students’ minds are open to education and information. 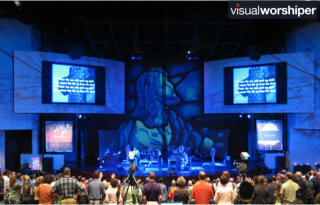 Controlling the visuals in a room by projecting on the walls enables a presenter to captivate interest and stimulate the imagination of an audience. 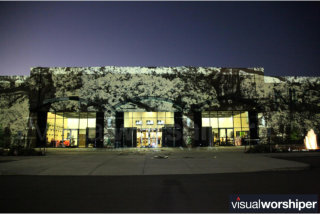 Because Environmental Projection uses your architecture as the canvas, projector selection is dependent on a large number of variables. Brightness is one of the most important features, but also warping features, stock lens options, and warranty/service are all key features.Do we need to paint our walls with special paint? Usually not! Only if your walls are black or very dark blue/brown will painting be needed. Or, you can simply hang light-colored fabric to project on or use screens to create a video backdrop. Is a media server or special video hardware required?A media server is not required. Multi-display graphics adapters and other image processing hardware may be required to achieve a desired result. Speak with your EIKI dealer. Is this all run from a computer with software? Yes. You may already be using suitable presentation software!